Posted on April 1, 2019 April 19, 2019 . Lauren Haynes is currently on the Library Board and has an exciting background in musical theater and drama. She’ll show us how to warm up like the pros with some energizing IMPRO. A bit like being on stage but easy, fun and low stress– just some laughs among friends. Join in or watch the group. If you want to be there be sure to arrive or call the library 397-4801 by 6 pm ! TGIF Teen Night is held at Foster Public Library on the First and Third Fridays of each month. 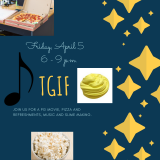 Students in middle school and high school are invited to drop by Foster Public Library for free movies, games, and technology exploration. There are new programs each month; ideas from teens welcome. Light refreshments are provided. For more information call 397-4801.